The first update to what some thought was a buggy iPhone 2.0 release has arrived. In its typical terse style, Apple didn't go into details on what the new software fixed. 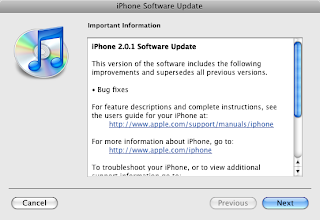 According to Apple iPhone software 2.0.1 contains "bug fixes." At this time the 249MB update is only available by connecting the iPhone to your computer and downloading through iTunes. iTunes will then prompt you to install the software and take care of the update procedure.